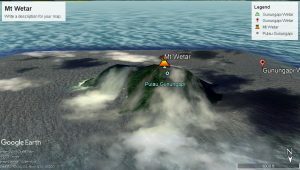 Wetar Volcano is an isolated volcanic island on the north of Wetar island in the Banda Sea, Indonesia. Verbeek (1908) analyzed two examples of andesite lava taken from the east coast, consisting of fine-grained andesite pyroxene with phenocryst plagioclase, hipersten, augite, biotite and olivine containing picotite, magnetite and apatite and the basic period of pyroxene microlite, plagioclase, and ore minerals colorless to brownish. PULAU WETAR, PROVINSI MALUKU; Robertus S.L.S, Herry S, Andri Eko A. W.